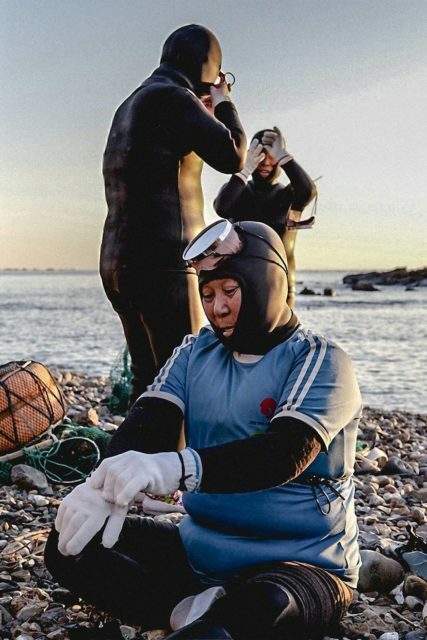 For centuries, the haenyeo, or “sea women,” from the Korean island province of Jeju have been diving into the chilly ocean waters in order to make their living by harvesting abalone, conch, and octopus. 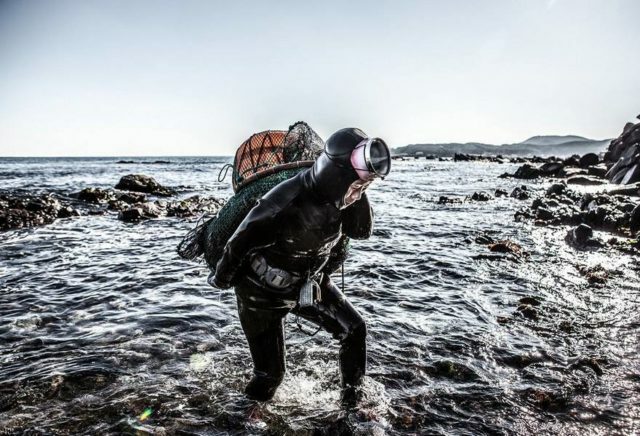 While this might sound like an easy task with all the modern diving equipment available nowadays, the haenyeo never use any breathing equipment. Also known as Korean Mermaids, haenyo are able to dive up to 65 feet (20 meters) under the sea, holding their breath for as long as two minutes at a time. 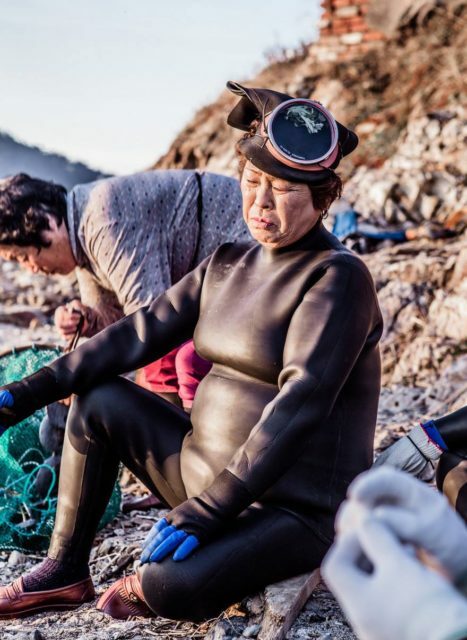 As reported by the New Yorker, the “sea women” of Jeju wear old-fashioned headlight-shaped scuba masks, with lead weights strapped to their waists, so they can sink faster. A flotation device called a “tewak” is left on the surface of the water with a net hanging beneath the “tewak” where they store the harvest. Many of them use various tools to dig conch and abalone from the crevices on the sea floor. Jeju’s diving is one of South Korea’s most fascinating and enduring traditions and its origins can be traced back to 434 A.D. 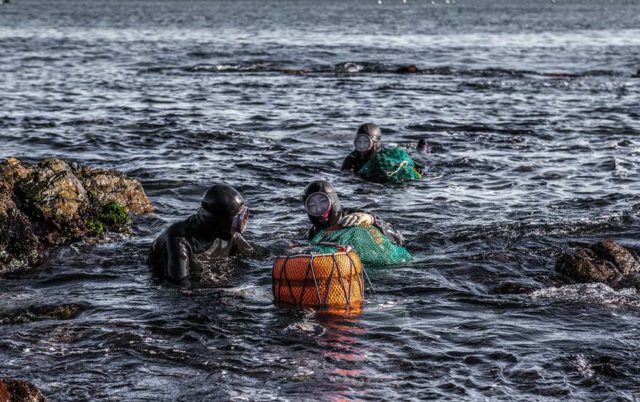 It was originally considered to be a male profession, but this changed in the 17th century and by the 18th-century females largely outnumbered male divers, thus becoming primary breadwinners of their families. Historical records suggest several different explanations of how this tradition came to be closely identified with females. Some sources state that in the 17th century a great number of men died at sea due to war or fishing accidents, and diving became women’s work. 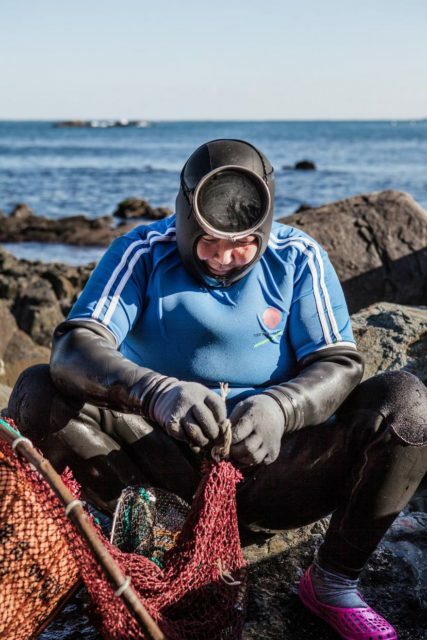 Another explanation suggests that the main reason why Jeju’s diving became mostly women’s work is that women can tolerate cold water better than men due to the higher percentage of body fat. The final explanation states that although the Korean king conscripted many men into his army, he still required women to pay steep taxes in dried abalone. Jeju’s women had no other choice but to dive in the cold water, with many of them diving despite the fact that they were pregnant. Most of the harvest was given to the Korean king as a tribute, but in 1910, when the Japanese occupied Korea, this practice was abolished and haenyeo were free to sell their harvest on the market. Over the years, diving became a profitable profession and many haenyeo drastically improved their financial well-being. A great number of them were even hired by Japanese merchants to work as wage-laborers in Japan. 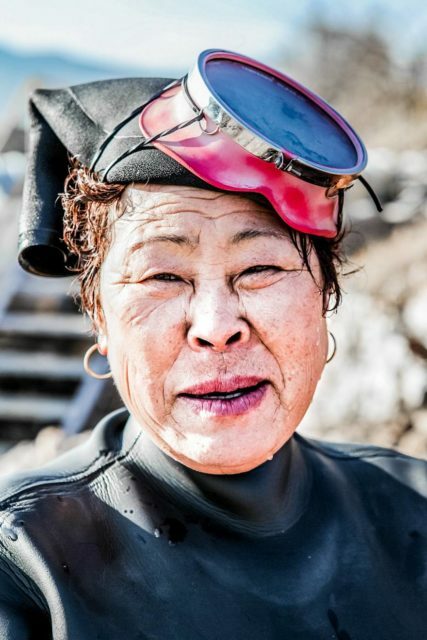 The conclusion of World War II in 1945 brought the end of the Japanese rule in Korea, but women divers continued being an integral part of Jeju’s economy. 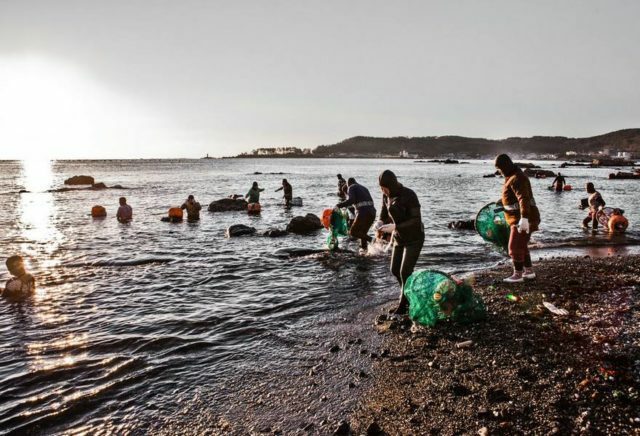 Over the years that followed after the end of the Japanese occupation, haenyo became primary breadwinners in the Korean island province of Jeju. For many families, sea-diving was their main source of income. Men took care of the home, looked after the children, cleaned, and cooked, while women took care of the financial well being of the family. 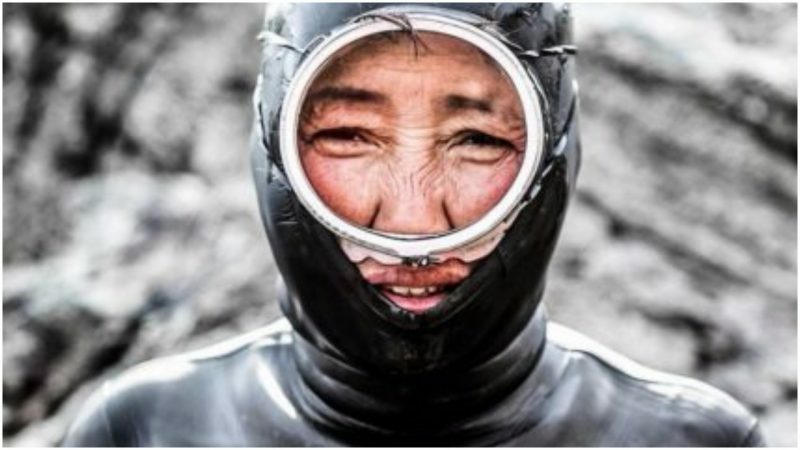 As reported by the New York Times, about 21 percent of the Jeju’s women were professional divers in the early 1960s. The tradition was handed down from mother to daughter for years, but since the work is both hard and dangerous, many younger women nowadays refuse to work as sea-divers and would rather choose to work in resort hotels. Although haenyo were very independent, men still continued filling all political leadership roles. 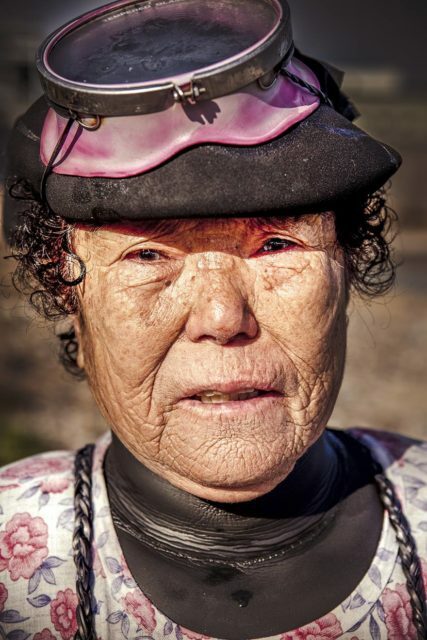 The women divers of Jeju were often forbidden to travel outside their villages or reveal their skin. For years they wore homemade cotton suits when diving in the freezing waters of the ocean, and the biggest change for the Korean mermaids came in the 1970s when wetsuits became available. This change made it possible for them to dive deeper and spend more time underwater, thus increasing their incomes. However, eventually this led to overharvesting and decline of income. Spending more time underwater also brought many risks and health problems for haenyo and women slowly abandoned the sea-diving industry. There were over 26,000 haenyo in the 1960s and nowadays there are less than 4,500. The Jeju government struggles to keep the tradition alive, but younger women are not interested in becoming haenyo. 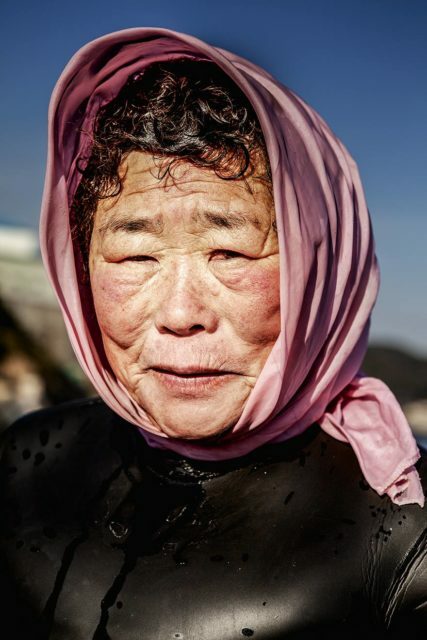 The tradition of Haenyo still exists and New York-based photographer Mijoo Kim captured the last generation of Haenyeo. Mijoo Kim who is a Korean visual artist, told the Huffington Post that haenyo are carrying on a Korean legacy and will be the last of their kind. 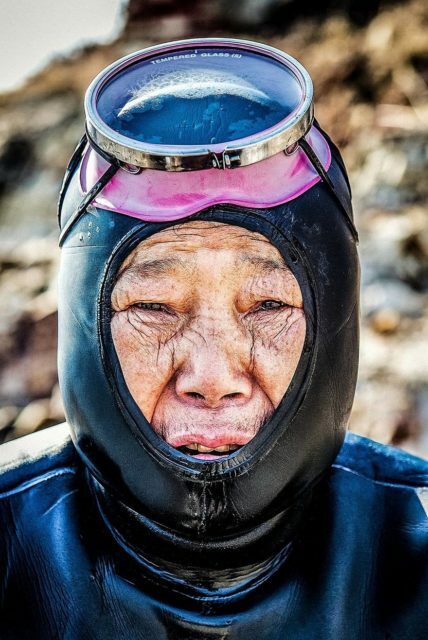 Perhaps that is why younger women refuse to work as sea-divers and today nearly 100 percent of haenyeo are over the age of 50. The Jeju government continues its struggle to save this tradition and a few years ago they requested that UNESCO add haenyeo to its Intangible Cultural Heritage list, but if this trend continues there will be no haenyeo at all in near future.